The committee’s report will finally be published today. 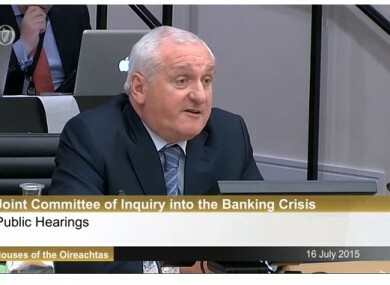 Former Taoiseach Bertie Ahern giving evidence to the banking inquiry. THE BANKING INQUIRY report is finally set to be published today, after several stumbling blocks in recent weeks. Bankers, politicians including former taoisigh, financial regulators and members of the Troika were all interviewed by the committee. Sinn Féin’s finance spokesperson Pearse Doherty and Anti-Austerity Alliance TD Joe Higgins refused to sign the report last month. A number of commentators have described the final version as “toothless”. The inquiry is estimated to have cost in the region of €5 million. The report will be debated in the Dáil tomorrow. We want to know: Do you think the banking inquiry was worth it? Email “Poll: Was the banking inquiry worth €5 million?”. Feedback on “Poll: Was the banking inquiry worth €5 million?”.